Let us paint a picture for you. It was a Wednesday night. You weren’t going to go out because you had to be at work early the next morning, but your stupid friends convinced you to come to the bar for “one drink” at happy hour. Well, one drink turned into eight, plus shots (and who knows what else tbh)...and the next thing you know you’re waking up in some half-eaten takeout with a splitting headache and a meeting in less than an hour. WHAT YOU GON DO? Maybe these things will help. If you fell asleep with your makeup on it’s time to let your skin breathe. Our favorite makeup remover right now is Caudilie’s Micellar Cleansing Water – it’s great for sensitive skin. Coconut oil also works well as makeup remover, just keep in mind it can be hard to wash off. Many makeup removing wipes are full of nasty ingredients that do more harm than good, but they will get the job done. Burt’s Bees Facial Cleansing Towelettes with White Tea Extract are fairly gentle, and they smell really nice. Vitamins: they do the body right, take em! Vitamin C and B complex are super great for restoring energy and making your brain work again. We can’t tell you how many times we’ve been saved by Emergen-C after a rough night of karaoke-gone-wrong. If you wanna be a real pro, take them before you start drinking. But we gotta be honest, we never remember to do that. This is a tried and true tip we learned ages ago while pulling all-nighters for high school exams. Throw a couple spoons in the freezer for 10 minutes. Gently press the rounded side to your eyelids, and reduce puffiness and redness in an instant. Tinted moisturizers are our hangover saviors. NARS Pure Radiant Tinted Moisturizer can be applied with clean fingers or a beauty blender and gives you a little glow, with the added benefit of SPF 30. Eye gel can also be hydrating and help wake up the undereye area. Clinique’s All About Eyes Serum can be put in the freezer for an even more refreshing effect. If you’ve put on your tinted moisturizer and you still look like an extra from the Walking Dead (it happens), then it’s time for a little concealer. We love NARS Radiant Creamy Concealer or Kat Von D Lock-It Concealer Creme under the eyes and on blemishes. Now you might wanna define your eyes and add some color to your face. Even if you don’t have time for a full look, mascara and a tinted lip balm are easy to apply. Almay’s Get Up and Grow is a soft and nourishing mascara that we love for a more natural look, and adding a couple swipes to your eyes will help widen your currently half-closed lids. Almost every makeup line has a tinted lip balm. Our current go-to tinted balm is Etude House’s super moisturizing Apricot Stick. This slightly tinted balm is great for a touch of color to lips and dewy cheeks. You probably have a lot of products in your hair from the night before (and sweat from all that table dancing.) Dry shampoo will give life to flat, nasty roots. We prefer Living Proof Perfect Hair Day Dry Shampoo, because it actually cleanses your hair. If you’re on a budget, Not Your Mother’s Clean Freak works great, too. 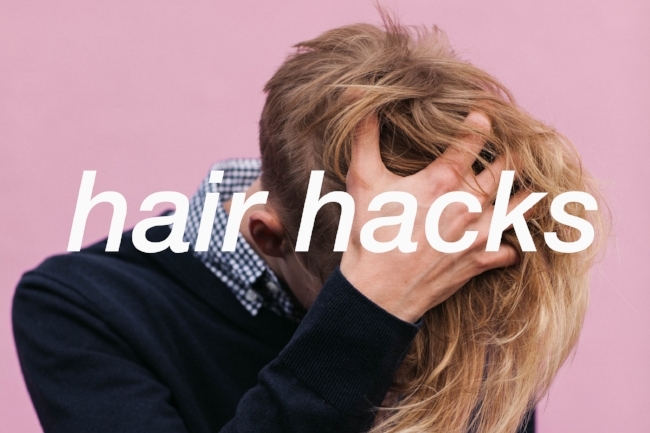 If your hair STILL looks a mess, we don’t know what to tell you. Just kidding - you can always throw it in a topknot or loose braids, or use the original dry shampoo. A hat.